Crème brûlées are super easy. They're one of my favourite desserts to boot. I make a lot of meringue desserts, so tend to default to crème brûlées any time I can't think of another use for the yolks. First, you need to heat some cream and vanilla. I use vanilla bean paste and seldom measure. I just add enough to make it suitably spotted with vanilla seeds. 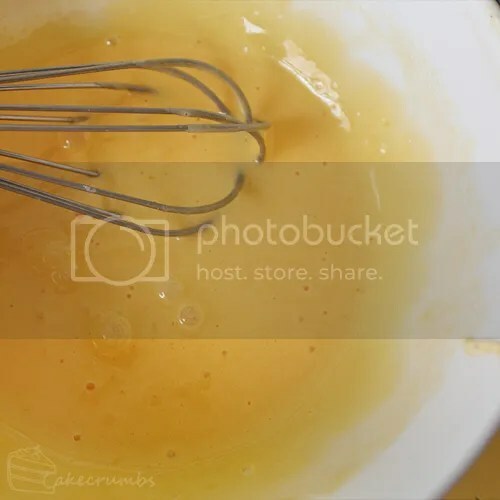 While that's left to infuse, you whisk your yolks and sugar until pale and creamy. Then you whisk in your cream mixture and we're good to go! 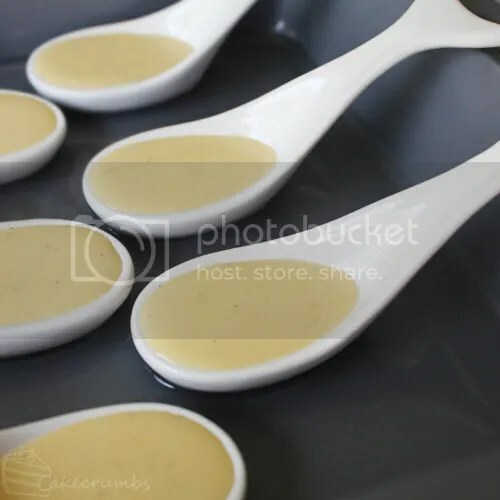 Pour the custard into the baking dishes set in a water bath (I use a cake tin for the purpose), and bake! Soon enough, you'll be ready to put the gorgeous toffee on top of the smooth, creamy custard. 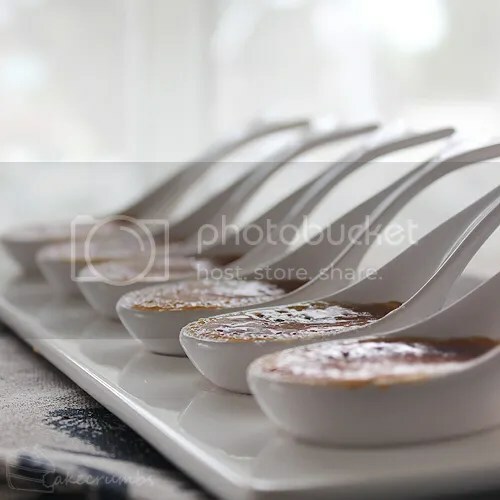 Did I forget to mention that the spoons were whale tails? Aren't they just perfect! Yes. I am in love with a set of spoons. During the time the dessert had been swimming in circles round my brain, I'd wondered about the palatability of the dessert. Would they be easy to eat? Would they come off the spoon okay? Would they taste okay? Would the toffee be too hard? As soon as we tasted them, all those fears disappeared. They tasted absolutely perfect. It delivers everything there is to love about the brûlée in a single mouthful. Now, I have to admit to being a picky, methodical consumer of the brûlée. I like to crack off enough toffee at the beginning to give access to the custard, finish the custard and save the rest of the toffee for last. So I was quite sure I'd miss this aspect of savouring the toffee, but I didn't at all. The toffee was just perfect, and played it's textural role to the fullest extent. It's a perfect dessert as a canapé. This is definitely a dessert for a platter or a party. Since it was just us and the brûlées, I poured the rest of the custard into 1/4 cup capacity ramekins and baked for 20 minutes longer than the spoons. It also gave me a chance to play with some sugar. I made a couple sugar cages for serving. 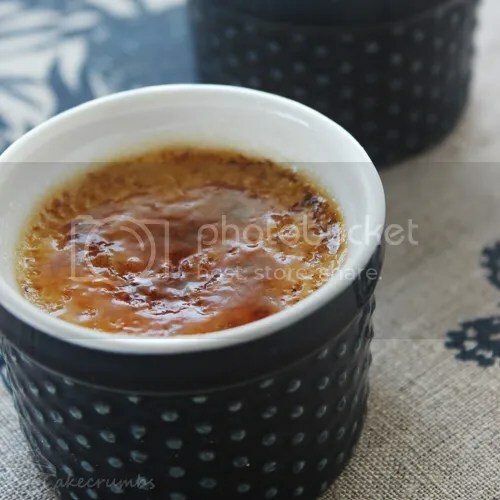 One of the best things about the humble crème brûlée is that you need less of a recipe and more a ratio. The below quantity can be increased to make as much or as little custard as you want. I had 3 egg yolks to use, so I tripled the rest of the ingredients accordingly. This quantity will make enough for quite a few spoons. 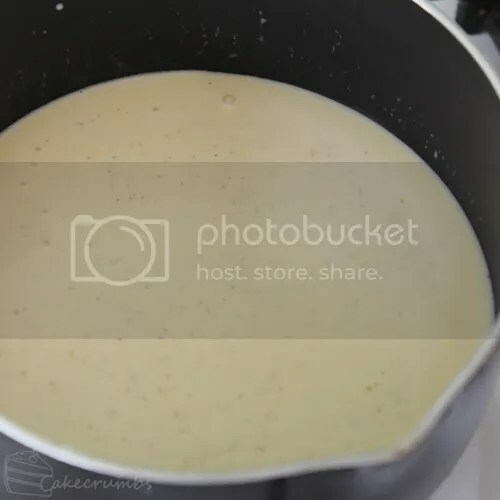 Place cream in small saucepan with vanilla bean paste and stir over medium heat until cream just begins to boil; remove from heat and set aside for 10 minutes to infuse. Bake for 20-25 minutes, or until just set (custard will have a slight wobble). Transfer dishes to a tray and cool to room temperature before refrigerating; place in fridge for at least 4 hours. 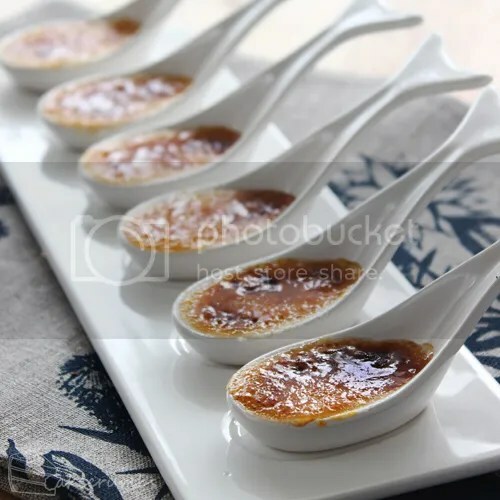 When ready to serve, sprinkle brûlées evenly with caster sugar and use a blow torch to caramelise the sugar. 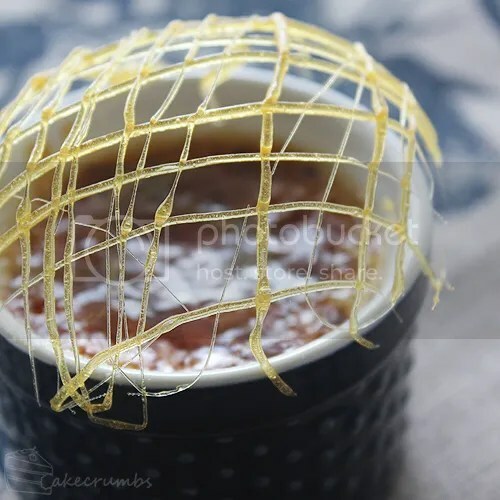 Alternatively, place under a grill for 1-2 minutes (note that this option will warm the custards, especially in such a small dish, and you'll have less control over caramelizing the sugar evenly). What an interesting dessert alternative to serve. Very unique idea to serve them – would be great at a party. The use of the vanilla bean paste is always a favourite for me. Vanilla bean is the bomb. Added you! Are you on Pintrest by any chance? I followed the link from your dA account when I saw this idea! 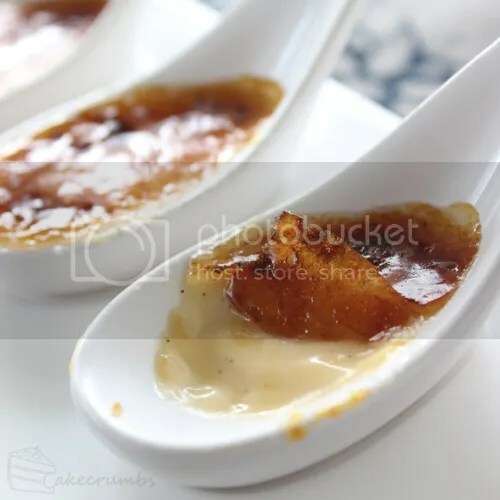 I had never had crème brûlée until last spring, at a Parisian pâtisserie. And it. Was. Life-changing. Actually, it was the only thing about Paris I liked. I’ve desperately wanted to make my own, but I was always led to believe it was very difficult. And then I read your recipe and for the first time I have hope. I simply have to try my hand now! I only have one question… What kind of cream would I need/do you recommend? The most adventurous I’ve been in cooking with dairy is using half-and-half for scones. Though I usually have heavy whipping cream on hand (for Irish coffee reasons.) Would I need something between the two for this? Oooh my, crème brûlée in Paris sounds amazing! You can basically use any cream. 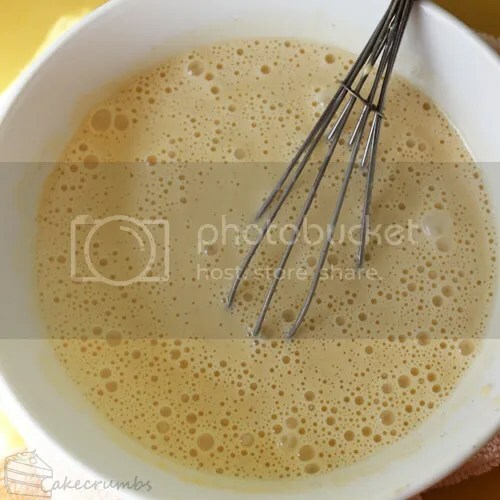 I use what we call thickened cream (i think it’s about 35% milk fat and has some stabilisers in it — I think that’s what elsewhere calls whipping cream? I’m not entirely sure on this) because it’s cheap and I always have it on hand for cooking. You can use a more expensive cream with a higher percentage of milk fat if you want a richer result. Cute idea. I adore bite sized foods too. Thanks! They’re just so fun. You can use most any cream that doesn’t have any weird additives. I usually use what we call thickened cream, but pure, single or double cream is fine. 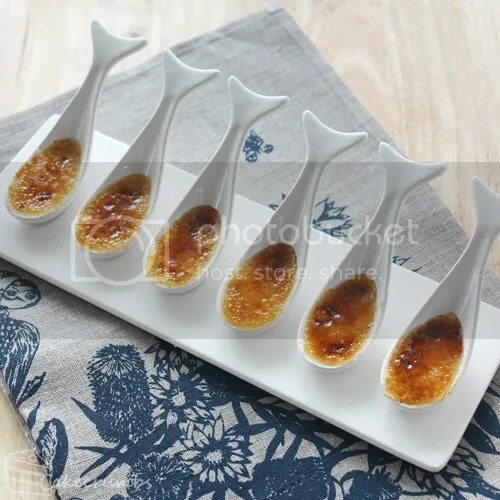 Where did your sister buy you the ceramic whale tail canape set from? My sister in law is desperate for them. And you desert looks amazing too by the way. They were gifted to me.